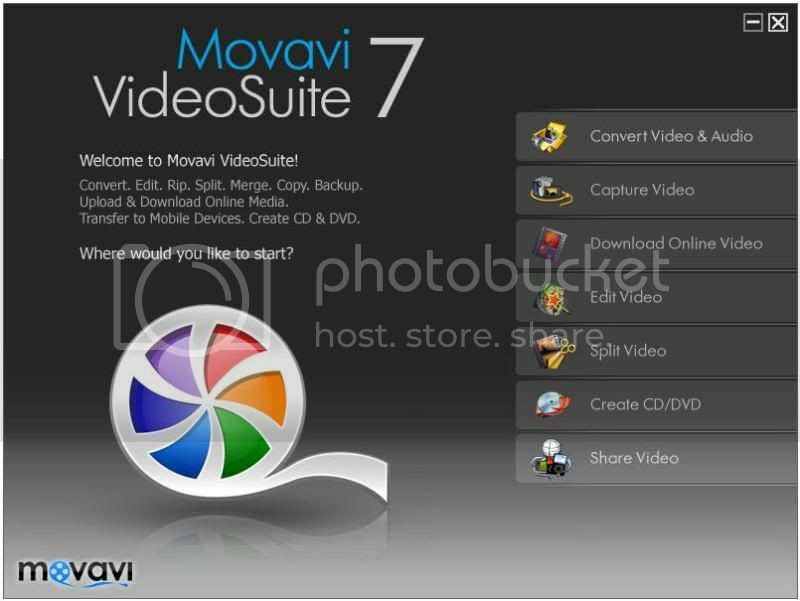 Movavi VideoSuite 7 is an all-in-one video and DVD program that gives you SEVEN amazing DVD and video tools in a single package. Edit. Convert. Rip. Transfer to and from mobile devices. Download online video. Split. Capture. Burn. Copy. Backup. Output formats: AVI (DivX, XviD, etc. ), MPEG (MPEG1, MPEG2, DVD, VCD, SVCD), MP4 (iPod, PSP, H.264, H.263, MPEG4), 3GPP, 3GPP2, WMV, RM, QT, MP3, WAV, WMA, BMP, GIF, JPEG, PNG. Just add your DVD and hit the Convert button - no need to know anything about the DVD or its content. Movavi VideoSuite does it all automatically. Link as many files together as you need, in any format. You can even link DVD chapters and save them as one complete movie. Movavi Video Converter is the only video conversion software to include these powerful editing tools. Crop video quickly and easily to convert a specific rectangular area within the video. Rotate video by 90, 180, or 270 degrees. The feature becomes useful if a device rotates captured video. The Adjust video tool lets you to polish the quality of your video automatically, adjust brightness, contrast, and use artistic effects to make it something special. Add Watermark - text overlay with control over font, font size, border and background, even add a graphic logo. Miss the music from your favorite movie? Take it with you! Use Movavi VideoSuite to save soundtracks as MP3, WAV or WMA files. Save those special moments as still photographs with Movavi VideoSuite. Now you don't even need a stills camera to create a great photo album. You can reduce the size but save the quality if you use Movavi VideoSuite for conversion. WMV, RM, MOV are the best formats for the Internet video streaming. Convert as many files as you need simultaneously to any number of different formats. Movavi VideoSuite provides practical as well as creative tools. Convert from the big movie just the video fragment that you need. Convert video for any mobile device - iPod, PSP, iPhone, Zune, Creative Zen, Archos, PDA (including BlackBerry), cellphone - in the Devices mode without any knowledge about video formats and characteristics. Change, adjust and fine-tune parameters of your video in the Advanced mode for the output format setting. Save newly created and most often used presets in the Favorites mode. Rip DVDs and save them to any mobile device in a few simple steps. Full ripping support provides the best possible conversion quality. Movavi VideoSuite lets you reduce the size of your video files without affecting the quality, ensuring you save your videos in the most appropriate video format. Capture video and audio to your computer from your DV camera. Grab and save video to your computer at the same time. This saves your time and is ideal for capturing video greetings and messages. Up to five times faster than other splitting processes! Movavi VideoSuite uses unique high-speed splitting technology to prevent any loss of quality when splitting an AVI file to AVI segments or an MPEG file to MPEG segments - without no need for re-compression. You can split, cut and trim your video automatically by size, time or number of segments. Choose the output format and beginning and end points of each segment to be split out. You can select as many fragments as you want at once, including intersecting fragments. Create more than 20 amazing video postcards from any video. Video Message features 13 professional and 13 holiday frames to match any mood and occasion. Capture video from your webcam right inside the module. Your captured video will be automatically saved and opened for the further design. Video Message converts created video postcard to formats suitable for sharing via email and blogs. Add text to the intended part of a frame and make your video messages personal and special. Edit video on the storyboard. Insert transitions. You can add videos to the storyboard, split them into scenes automatically or manually, and insert cool transitions. After editing is done, you can save the movie for any device or burn it on CD/DVD. Improve the quality of your videos in just minutes by applying one of the many included video filters and special effects. Magic Enhancer, Auto Contrast, Auto Saturation, Auto White Balance - automatically polish the quality of your video with the click of a button. You don?t need to know anything about video editing or remastering to dramatically increase the quality of your videos. Experiment with professional-grade cleaning filters like de-noise, de-block, brightness/contrast, gamma, color balance, and more to restore the original quality of old or damaged videotapes. Movavi VideoSuite features several artistic filters to give your home videos that something special. Choose from Mosaic, Add Noise, Posterize, Diffuse, Grayscale, and Invert. Just apply the filters you want and see the ?before and after? effects side by side on the split screen. It's as easy as 1-2-3! Use Movavi VideoSuite to burn you favorite video to CD or DVD. You can create high resolution, wide-screen video DVDs and play them on your wide-screen TV! Choose among more than a dozen of original themes to create a static or animated DVD menu. Add your music or use a default audio file - and your DVD will instantly grip your viewers attention! Create audio CDs from any source materials and take them with you to listen in a car or on a portable CD player. Copy and back up data from your hard drive to a CD or DVD - so you'll always have an extra copy available. Make copies of special event video records - weddings, parties, vacations - so you can send them to your friends and relatives.